For a long time making hot water with sunlight has been an emotional favorite of sunlovers and nature freaks. When my mother and I visited the Farm I remember that the hot water for the laundry house came through a black hose laid out all over the roof of the little shack. The more sophisticated solar hot water systems use glass and copper collectors, a temperature-controlled pump and a large storage tank to absorb and save the sunlight for nighttime use or on cloudy days. By the time you get all the parts in place to prevent the system from freezing, from overheating, from backfeeding the panels, and to ensure the water is hot even if it’s been cloudy for a few days the whole contraption isn’t so much like basking in the sun as it is a mini mining operation. In fact, hot water from the sun isn’t any more natural than electricity from the sun. In the last decade the price of copper has risen to an uncomfortably high level, and that has greatly altered the appeal of solar hot water systems. If it were cheap to install, a system that overproduced for half of the year and underproduced for the other half, had no more than 24 hours’ worth of storage capacity and was prone to messy plumbing failures… well, some folks might think that’s an ok deal, IF it was cheap. But solar hot water is not cheap, and there is a better way. For the first six months in our home we used the electric water heater that came with the house. An electric water heater is about 90% efficient. Ten percent of the electric energy that goes into the water ends up being lost to the space around the water heater. That’s pretty good. Modern electric water heaters are generally pretty well insulated and you can cut down on the heat loss even further by insulating the pipes within 6′ of the tank and protecting the water heater from really cold temperatures. A way to estimate how much electricity you’ll use for hot water is to multiply the number of folks in the house by 1000 kWh/y and then add another 1000 kWh/y. We have four people in our household, so 5000 kWh/year for hot water. You can add or subtract if you know people take long showers or do lots of laundry, or you have water saving fixtures. For us we probably would be using less than average, maybe 4000 kWh/y. The grill on top of the water heater tank is where the air is drawn into the compressor. I’ve ducted our dryer so the warm air blows toward the water heater. That was a really bad idea because everything got very linty. As efficient as an electric water heater is, it still uses a lot of electricity. We wanted to cut down on how much energy we use for hot water, so we swapped out our electric water heater for a heat pump water heater, which also uses electricity as the “fuel”, but has an efficiency of greater than 200%. How is that possible? Read the post on heat pumps to get an understanding. Now our water heater uses about 2 kWh/day in the summer and about 3 kWh/day in the winter. The seasonal difference is due to two things: people tend to use more hot water in the winter, and the temperature in the basement, where the water heater is, is lower in the winter and that really hurts efficiency. We haven’t been metering the heat pump water heater for a full year yet, but my guess is we’ll use between 1000 and 1500 kWh/year to heat water. That’s much nicer on our energy budget. When there’s a lot of solar energy, like a sunny summer day, a solar electric system can capture all that energy, while a solar hot water system has to shed all the energy beyond what the water tank can store. A solar hot water system needs more intense sun to start making hot water than a PV system needs to start making electricity. In other words, PV can still harvest energy in marginal conditions. With net metering for solar electricity the utility will bank your extra electricity for use another time. On cloudy days a heat pump water heater can draw down the solar credit from the utility, while a solar hot water system would need to use a backup fuel. The cost to install a heat pump water heater and small PV system is about the same as the cost of a residential solar hot water system, but an all-electric system will satisfy the whole hot water demand, while a solar hot water system will require some fuel or electricity to make hot water on cloudy days. One really big difference between solar hot water and a heat pump water heater is that the heat pump water heater takes energy from the space around it to heat up the water. It has the effect of cooling the space, like an air conditioner. A heat pump water heater also dehumidifies the air slightly. Manufacturers of heat pump water heaters will tout this as a great benefit of heat pump water heaters, but in fact they do very little dehumidifying and the cooling is almost never a positive thing. In the South the water heater is often installed in the garage to save space inside the house. AC out there is pointless. In the North we almost always put the water heater in the basement where even in the summer we usually don’t need cooling. If you’re thinking, why not put it in your bedroom so you can enjoy the cooling in the summer, don’t forget it’ll cool even in the winter, and it’s a compressor so it’s noisy. Some heat pump water heaters can be ducted so the cold outlet air can be exhausted outside the building. In the North that’s usually not a good idea because for most of the heating season the replacement air that enters the building is colder than the exhausted air. So, you’re getting rid of cold air, but you’re replacing it with even colder air. There are good applications for heat pump water heaters. 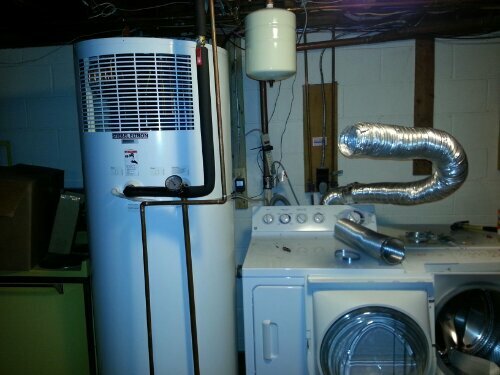 There are bad applications for heat pump water heaters. And then there are energy freakshows. If your basement stays around 60 degrees all winter long, you might do well with a HPWH. If your basement is cold, leaky and uninsulated, do something about that and then see whether you can maintain 60 deg F.
If you have an old oil boiler in the same space where the HPWH would go, generally they put off enough heat that a HPWH will make a very happy roommate. If you have no source of heat in your basement, a HPWH is probably a bad idea. This is serious. Without the oil furnace that used to be in our basement, the HPWH got our basement down into the 40’s F.
If your house is on a slab probably you don’t have a good place to put a HPWH because anywhere inside the house the noise will bother you and anywhere outside the house will be too cold. If you heat with electricity don’t install a HPWH; you’ll be better off with a standard electric resistance water heater. If you live below the Mason Dixon line and have a place for it where the noise won’t bother you, get a HPWH. If you heat with wood and you can put the HPWH near the wood burner, go for it. That’s what we’re intending: a wood-warmed space for our inside-out-air-conditioner water heater. It’ll be like making hot water in the tropics. Finally, most heat pump water heaters will switch into electric resistance mode if your hot water use outstrips the capacity of the compressor. That will make the efficiency of the water heater drop dramatically. To get the most out of a heat pump water heater: get the biggest tank you can, use water-saving appliances and fixtures and set the controls so the electric resistance doesn’t come on unless the tank temperature gets really low. Want to know more? Here’s a really great blog post on Heat Pump Water Heaters.